Of course, it doesn't do any good if the vitamins I take aren't healthy in themselves. That's why I love that all vitafusion™ products are gluten-free and made with natural fruit flavors and colors derived from real fruits, vegetables, and plants. Beyond that, though, they taste so good! 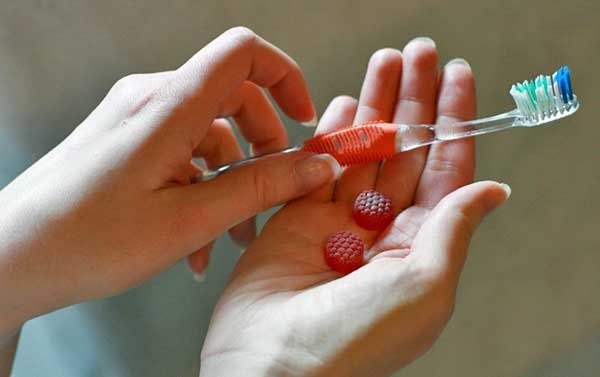 Forget swallowing hard tablets — I just pop and chew two tangy, cherry-flavored gummies once a day for a burst of fun and flavor. I can take them anywhere, making them very convenient to travel with as well. I've made supplements such a part of my daily habit that I rarely forget to take them, but if I did, I could easily grab one of these on the go — no need to find a glass of water first. Tip: Link your vitamin-taking to a daily habit that's already well established. and it's a pleasant, healthful end to my day! And did I mention we're off most added sugars? That means I really, really, really enjoy this daily indulgence of something so tart and tasty. These are not vitamin-y tasting; they're just plain yum. After all, being healthy should also be enjoyable! It's what vitafusion™ calls "healthy fusion," and I couldn't agree more. You can find vitafusion™ at club, mass, drug and grocery stores nationwide including: Costco, Walmart, Target and Walgreens. Find more information at www.gummyvites.com. If you're looking for a brand for your kiddos, try L’il Critters™. My kids love their daily multivitamin and Vitamin D gummies! L’il Critters™ gummy vitamins have no high fructose corn syrup or synthetic (FD&C) dyes, and they're gluten free. What healthy goal are you currently pursuing in your life? 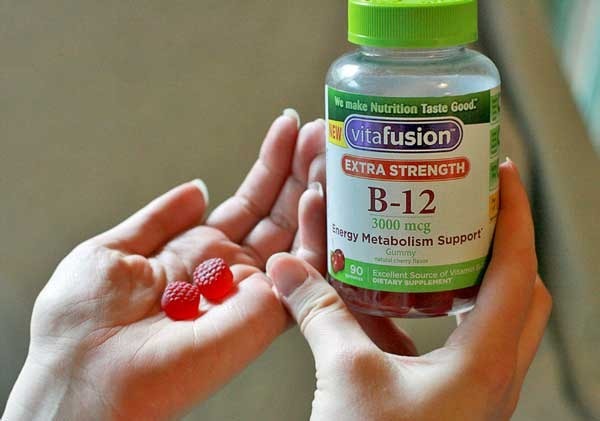 Be sure to visit vitafusion’s brand page on BlogHer.com where you can read other bloggers’ posts! Disclosure: This is a sponsored review from BlogHer and vitafusion™. Please consult a health professional with any medical questions. One of my healthy goals is to start jogging/running. I currently enjoy going on daily nature walks. I am walking 5 days a week and eating a healthy diet by adding more fiber and eating quiona. I also eat organic fruits and vegetables every day! I have been diagnosed with Type2 Diabetes. So we have overhauled our diet and gotten a gym membership. My goal is to actually go to the gym now. It's hard when you work from home and homeschool to find the time, but I have to make the time so I can still be here with them. I quit smoking 11 weeks ago and I am determined to stay a quitter! I do yoga regularly, and am working to make it a part of my everyday. I'm also doing my best to eat a more balanced diet, with lots and lots of fresh fruits and veggies. I went gluten free as a place to start making good eating choices. I’d like to eat fish at least twice a week. I'm wearing a pedometer and trying to increase my steps. I'm also trying to have my main meal at lunch time and a smaller, lighter dinner. I also did the alternate entry for this giveaway! I've been working to build muscle and gain weight in a healthy way for the past few years and have made a ton of progress this year. I'm not at my goal yet, so I need to up my weights and reps. It's been challenging, but so worth it! A healthy goal I am currently pursuing in my life is exercising daily. I do yoga daily and am currently adding Pilates into my exercise routine. trying to do yoga daily, not easy to do. I try to watch my carb intake and sugar. I am currently trying to get more sleep and relax more so I don't burn out. I am constantly busy and find that I often sacrifice much needed sleep which isn't good. I'm trying to cut sugar out of my diet right now. The healthy goals I am currently pursuing in my life is being more active, so i have picked up jogging daily. I am trying to stay motivated to work out all year, instead of just before we go on a big ski trip. Lately I've been using the Runkeeper app to try to run more. when i had my annual physical last month she asked me to set a goal, so I said walking 2 miles 2-3 times a week. So far I've done it about twice a week! To have a healthy pregnancy and not gain too much weight!! I've been trying to drink water daily. I am adding minutes to my daily walking routine. i am pursuing the goal of being able to run a 5k! I've been thinking about ways to add more vitamins again without the smell or taste, since it bothers me so during pregnancy. These sound like a great idea and I think I'll go grab some! Finally going vegan, after debating doing so for years (seriously). I know it's not the ideal diet for everyone, but I'm pretty sure it is for me... and after nearly 3 weeks without any dairy, I am feeling great! I'm currently trying to cut down on my meat useage. I'm trying to loose some weight and trying to get my family to eat healthier. Thanks so much. I take 1-2 minutes to log my food either just before, or right after every meal. I quit smoking 3 months ago and now I want to lose the weight that I gained from quitting. I've been trying to drink water daily and walk more. I'm working on getting healthier, eating right and working out more. I'm trying to gain some weight and build muscle. The healthy goal I am currently pursuing in my life is to walk daily. Thanks for the giveaway! My current goal is to cut back on sugar and tone up ! The goal I'm working on is mostly vegan eating, daily exercise and getting tones muscles. I'd love to take yoga classes. I am focused on eating more vegetables and whole foods. I am working on eating healthier, walking more and cutting out soda. I recently quit my nightly glass of wine in order to lose a few pounds. I'm exercising to stay healthy! I'm working on increasing the level of my exercise to increase my stamina. I'm working on getting back to regular cardui and strength training workouts. I've been ditching gas-powered vehicles and walking places! It has been fun, and just a couple of days ago I wore new sneakers for the first time and they really pepped up my walking. I was so excited I wanted to shout from the rooftop to anyone and everyone get good sneakers, they will make you want to walk and walk!!! My daughter and I just joined a local gym for the summer. I'm trying to get more exercise and eat healthier and I'm doing that by having a veggie garden this year. I am trying to work out more often. Right now I only workout 1-2x a week. My goal is to exercise 6 days a week. I'm trying to eat as little sugar as possible! This year I'm trying to lose 50 pounds. I'm doing great! I am currently try to lose a lot of weight. I try to go for a walk every day to stay healthy. My goal is to walk two miles a day, I currently do a mile so I am working up to it. I'm trying to reach the goal of 10,000 steps a day. Some days I get there, some days I don't! My goal is to loose 25 pounds. I am strength-training at least 3 days a week. I am working on being able to run 5 miles every day. I'm trying to get toned again after having a baby. I am working on balance. Trying to find the balance is hard for me and I work towards making my life simpler every day. I'm trying yoga to limber up and get my joints healthy. One healthy goal is reaching 3 miles on my daily run. I am increasing my upper body strength. My healthy goal is to completely cut out soda, and just drink water. I'm working on it! The healthy goal that I'm presently pursuing is to do the recommended exercises my physical therapist recommended after I've had surgery. I would like to walk my dog every morning because we both need our exercise. I swim 3 times a week and eat mostly organic. I'm trying to drink more water. I want to cut down on how much soda I drink. I also want to walk more on the treadmill as we don't have anywhere we can just go walk. Thank you! I recently got a fitbit and my daily goal is 10,000 steps. I am trying to maintain an exercise routine and maintain health eating habits. My health goal is to become stronger, I'm walking 30 minutes 5 days a week. I'm trying to walk every day. I'm trying to stay on a more balanced diet. I found that since I no longer have family at home I was eating more fast food and frozen dinner. I am currently trying to remove soda from my diet. The healthy goal I am pursuing is to eliminate as much salt from my diet as possible to keep a healthy blood pressure. The healthy goal that I am currently pursuing in your life is to continue taking vitamins every day. I am meditating more regularly, as well as the yoga and strength training. I am trying to walk more every day, it's not easy but I am determined to do it! Losing weight is my goal! The beginning of the year the goal was to eat at home more and we've been doing a really good job of sticking to that! I am eating smaller portions and more healthy. I'm currently trying to eat more healthfully and lose a bit of weight.